Radicchio is a bright magenta chicory that looks remarkably like a light red cabbage that got stylish. It has white ribs among its purple leaves and is smaller and lighter than a head of red cabbage. A head of radicchio is heavier than a similar sized head of lettuce but much lighter than cabbage. The exterior leaves should look fresh and undamaged. The cut end can be slightly browning, but not dark and certainly shouldn't be icky looking in any way. Cooking softens the bitter edge of radicchio and brings out the bit of sweetness held way deep down in those leaves. Cooked radicchio is particularly delicious in omelets or other egg dishes. 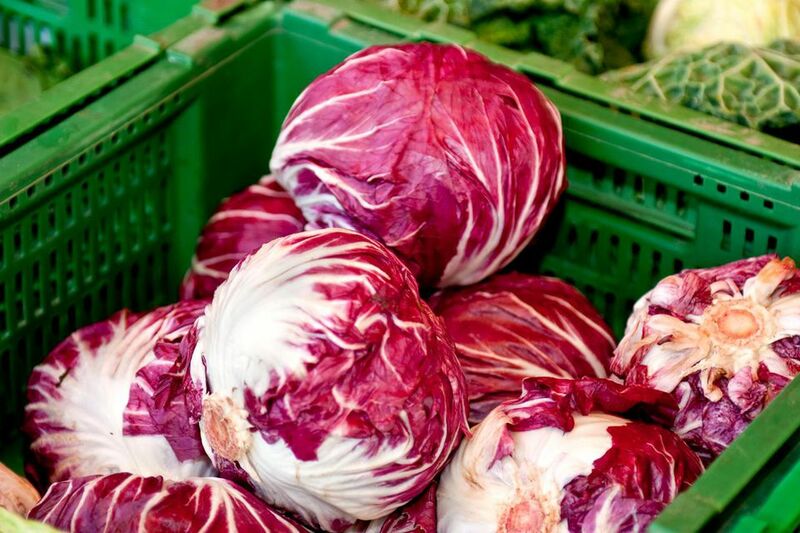 Keep radicchio loosely wrapped in plastic in the vegetable drawer of a fridge for up to a week. Temper radicchio's bitter edge by cooking it (see above) or serving it with sour things (vinegar, citrus juice, sour cream, salami), salty things (salt, olives, capers), or fatty things (oils, butter, cheeses, bacon) since they all chemically reduce the bitter compounds. Highlight radicchio's bright and bitter flavor by pairing it with sweet (sugar, fruits, jams) or pungent (mustard, anchovies, blue cheese, black pepper) foods. They can stand up to the bitter edge of radicchio, brightening that forward flavor without masking it. Treviso is milder than chioggia. Also look for castelfranco, which has creamy yellowish leaves speckled with bits of red. The whole head unfolds like a giant flower blossom and is delicious in winter salads. Also keep your eyes open for tardiva, which has long finger-like leaves that are at their best when lightly sautéed.